These Blueberry Oatmeal Muffins are a healthier and lighter version of a basic, traditional Blueberry Muffin Recipe. Still moist and delicious, but just 4 Points per serving. I like to make a big batch and freeze some so I’ll have a quick and healthy Weight Watchers breakfast on hand whenever I’m feeling too tired (or lazy) to cook. They are also great to give to my toddler for a tasty and healthy breakfast on the go. 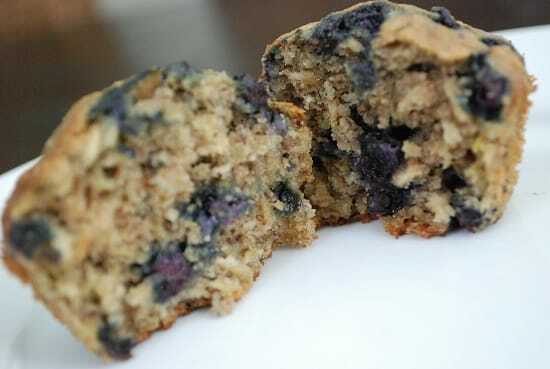 I’ve seen a lot of variations of these blueberry muffins with nuts or icing added, but in order to keep in Weight Watchers friendly, I stuck to the basics. Plus, I often enjoy a simple muffin without too many ingredients. Occasionally, I’ll add a tablespoon of flaxseed Powder for some added health benefits. This is really a deliciously healthy and easy muffin recipe to add to your collection, and it’ll satisfy your blueberry muffin craving without using up too many of your Weight Watchers Points. P.S. They go great with a bit of Brummel & Brown Yogurt Spread! Yum! Moist and fluffy, yet light and healthy, these low calorie Blueberry Oatmeal muffins are the perfect healthy breakfast idea. At just 4 Points each, you can enjoy a delicious morning muffin without an ounce of guilt. Add in flours, baking soda, baking powder, salt, sugar, cinnamon and nutmeg; stir well. In a separate bowl, combine buttermilk, oil, vanilla, lemon zest and liquid egg substitute. Then add to flour mixture; stir just until moist. Gently fold blueberries into batter. Spoon batter into 16 muffin cups coated with cooking spray. Remove from pans immediately; place on a wire rack. These are a great muffin to make and freeze so that you can whip a couple out and defrost on busy mornings. I did make a few changes based on other people’s comments – I used 2 real eggs instead of egg substitute, I added 1/4 cup of sugar free applesauce to combat the dryness others mentioned, I added 1/4 of sugar to sweeten them up, I only added 1/2 tsp of nutmeg since someone mentioned it could be overpowering, and lastly I added 1/4 cup of ground flaxseed meal. When I re-calculated the points based on my changes, these still weigh in at 4 per muffin. My kids think they are delicious and ask for them for dessert! These were pretty good. This was my first time making a “healthy” or WW muffin. They were a little denser than I’m used to, but they were pretty tasty. I used more blueberries than were called for and thought they were sweet enough. Thanks for the recipe! Hi I made these before but thought the nutmeg was too much, and needed to be a little sweeter… any suggestions that won’t impact the points? Is there a good substitute for buttermilk? Thank you! I know, right?! You’s swear I own that company or something! I’m OBSESSED with the stuff!